Every sport has rules that should just kind of go away. 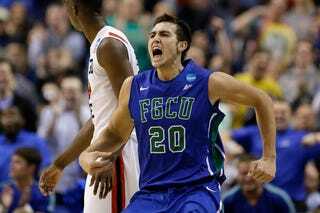 Tonight, America's favorite little college basketball team, Florida Gulf Coast, were victimized by one such rule when Chase Fieler's game tying basket was waved off in double overtime because he caught the ball before putting it in. The play started with 0.3 seconds remaining which, by rule, meant that FGCU could only score on a tip in, even if they got a catch and shoot off in less than 0.3 seconds. Pay close attention to the lights on the backboard, which don't go off until after Fieler's shot is released. So, even though Fieler successfully beat the buzzer and made the shot, Florida Gulf Coast still lost the game. The clock may have started late, or Fieler may have just released the ball very quickly. Either way, it doesn't feel right when such a great game ends because some rule nullified what was clearly a basket that was scored before the clock ran out. Florida Gulf Coast easily covered the nine point spread but, had the game gone to triple overtime, who knows if that would have been the case.